The Kingfisher 450cc is available to order now at our busy Albany yard. 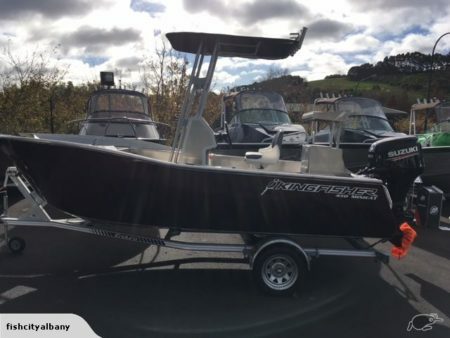 We have just soldf a beautiful bronze wrapped boat loaded with extras and has a 60hp Four Stroke Suzuki, vinyl sides, ttop, hydraulic steering, non skid , drink holders etc all for $42k. This has just been sold but another is on its way – photos will be posted when boat arrives. 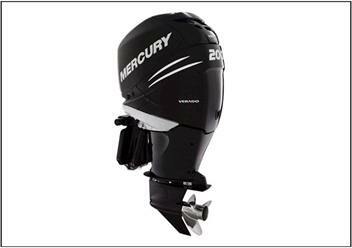 Order your boat now with your chosen accessories. Boat pictured in bronze has just sold while green boat is a sample boat and has sold. . 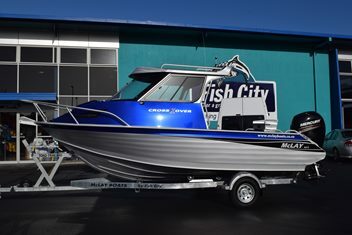 Fish City Albany are proud to be the current exclusive Auckland agent for this world beating design. 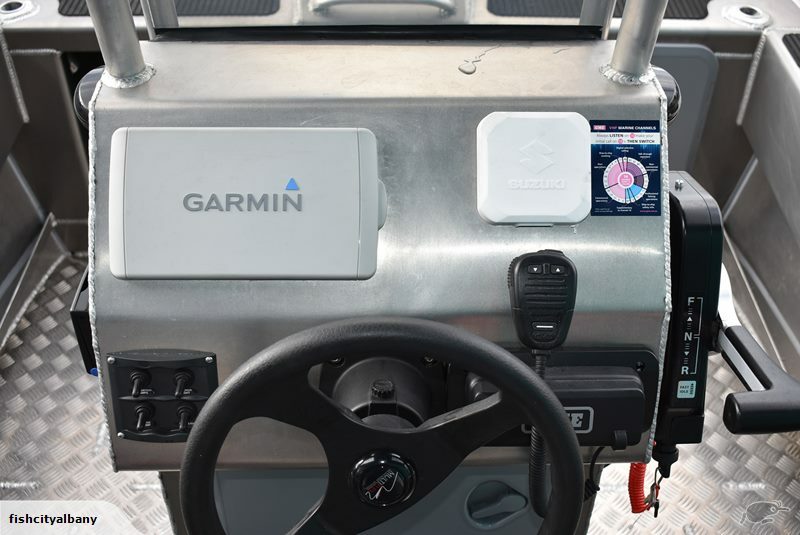 With the volume to match boats much larger, this makes for terrific useable space for all on board. 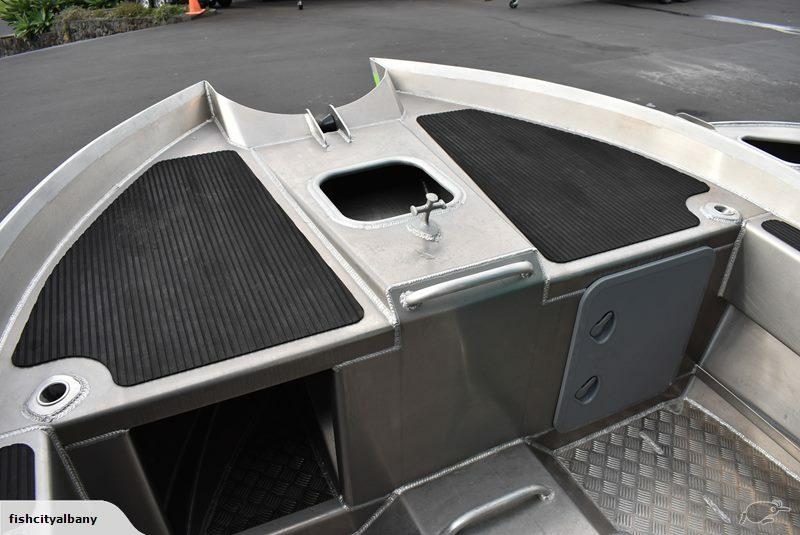 The twin hulls make for unbeatable stability (better than a pontoon) and with 2 separate dual buoyancy chambers and foam filled gunnels makes for the best in safety. Twin hulls give the best available ride in rough or smooth conditions, with amazing comfort providing a soft and secure predictable ride. 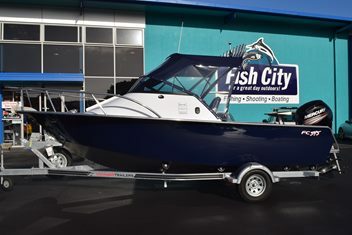 Designed for the fisherman who wants the best in performance, looks and durability, or the family who wants a safe and reliable cruiser suitable for a multitude of uses these boats are a must view for anyone wanting the best in what an aluminium boat builder can provide at a great price considering the room , features and quality construction. 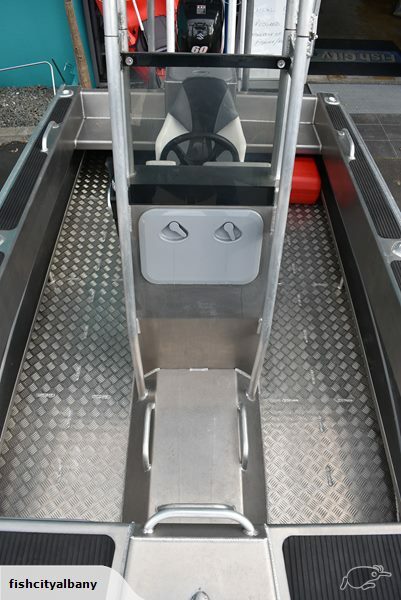 Low profile trailer’s makes for easy launching and retrieving, and are suitable for beach usage. We have a choice of trailers available in both galv or aluminium.